April 1965, Spring Vally, Washington D.C.
What’s this person best known for? Katherine Anne Porter is best known for her Pulitzer Prize winning fiction writing. Places where figure’s work often appears (magazines, radio, nightclubs, galleries): Her literary works have been published in news papers, magazines, as well as in a variety of short story and novel collections. Was this person a popular or critical success? No, she is mostly overlooked in comparison to other writers of her day. What primary research have you done?I have delved into the many critical reviews and articles written about Porters personal life and professional career. As well as reviewing correspondent between Porter and friends. Porter was a contributor to The New Republic at the time Malcolm Cowley was editor, she was also close friends with his wife Peggy Cowley. 1. Janis P. Stout. "Porter, Katherine Anne"; http://www.anb.org/articles/16/16-02186.html; American National Biography Online Feb. 2000. 2. Unrue, D. (1993). Katherine Anne Porter, politics, and another reading of `Theft'. Studies in Short Fiction, 30(2), 119. Retrieved from EBSCOhost. 3. Reuben, Paul P. "Chapter 7: Early Twentieth Century - Katherine Anne Porter." PAL: Perspectives in American Literature- A Research and Reference Guide. URL:http://www.csustan.edu/english/reuben/pal/chap7/porter.html ( 9 September 2011 ). 5.Stout, J.P. (1995) Katherine Anne Porter: A Sense of the Times. Virginia: University Press of Virginia. Residence: Pacific Groove, California during the 1930s. Occupation: American novelist, story writer, playwright, and essayist. Race/Ethnicity/Religion: German and Irish descent. Politics: New Deal Liberals, left wing. Steinbeck fought for the rights of the american migrant workers by bringing attention to them through his novels. These migrant workers and their lives were the basis and background of many of his acclaimed novels and articles he wrote for newspaper. In 1936, John Steinbeck wrote seven articles for "The San Francisco News." Later, he published them in The Harvest of Gypsies: on the road of the Grapes of Wrath, which was added the photographs of Dorothea Lange. Was this person a popular or critical success? He was both popular and critical success. What primary research have you done? I found analysis of the three texts in New York Times (Historical), and photographs Steinbeck's life in AP Images. Carol Steinbeck was first Steinbeck's wife. She was also a writer and edited some of Steinbeck's works. Harvest Gypsies was published with the photographs taken by Dorothea Lange. Will Rogers and John Steinbeck had similar views during 1930s. Charlie Chaplin was a hollywood fan of Steinbeck's works. They became friends. "John Steinbeck's Career and Books." Oprah. Oprah's Book Club, 03 September 2008. Web. 11 Sep 2011. Shillinglaw, Susan. "Steinbeck, John." Feb 2000. American National Biography. Web. 11 Sep 2011. Steinbeck, John. In Dubious Battle. New York: Penguin Books, 2006. Print. Born in Oak Park, Illinois. Died in Ketchum, Idaho. Lived in Paris, Madrid, and Key West in between. What’s this person best known for? 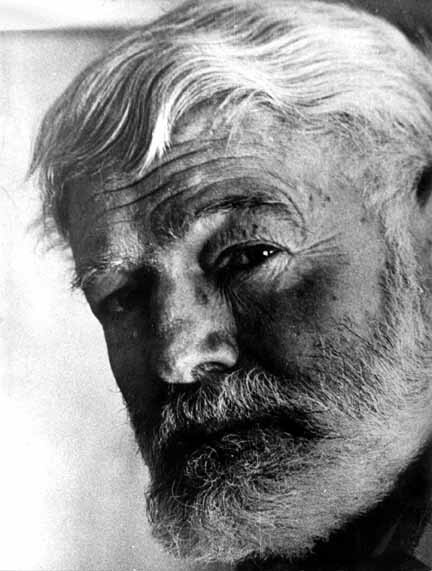 Ernest Hemingway is best known in the literary world for his distinct writing style and his adventurous personality. He is considered one of the classics of American literature. Hemingway was not actively involved in politics. Ernest Hemingway spent the majority of the 1930s summering in Wyoming and spending his winters fishing in Key West, Florida. In 1936, Hemingway went to Spain to cover the Spanish Civil War. The majority of Ernest Hemingway's works can be found in libraries and bookstores, as well as in American literature textbooks. During World War I, Hemingway showed support by joining the Red Cross and drove an ambulance. During the Spanish Civil War, he worked as a war correspondent for the North American Newspaper Alliance. Was this person a popular or critical success? Ernest Hemingway is considered one of the greatest classic American authors and won the Nobel Prize in Literature in 1954. During World War II, Hemingway was closely monitored by the FBI because of his alleged contact with Fidel Castro. In fact, Castro respected Hemingway's fishing abilities since he frequented the fishing holes around Cuba. Fidel Castro gave much praise to Ernest Hemingway for his fishing skills, not literary skills. Have researched books, newspaper clips, and photographs that are accessible through the TCU library. Hemingway formed a "fishing crew" while in Key West that included Waldo Pierce, John Dos Pasos and Max Perkins. Baker, Carlos (1972). Hemingway: The Writer as Artist (4th ed.). Princeton University Press. Fiedler, Leslie (1975). Love and Death in the American Novel. New York: Stein and Day. Occupation: Father Coughlin was ordained into the priesthood in 1916 after which he joined the National Shrine of the Little Flower as their priest. (2) During his tenure in the 1930's Father Coughlin became an influential voice in politics by promoting issues such as social justice. In doing so Father Coughlin, began to illustrate the importance of religion in the realm of politics. Father Coughlin's use of the new medium of radio allowed him to maintain himself as relevant and ubiquitous voice in a nation exploring new horizons in communication. This new found influence allowed him to take on various political endeavors. Catholic priest as well as a founder of the National Union for Social Justice, founder of the Union Party. Radio talk show host and publisher of the periodical Social Justice. What’s this person best known for? Father Coughlin is known for his nationally syndicated program of which has been said that "on a balmy Sunday afternoon one could walk down the streets of many an American city and never miss a word of his weekly radio broadcast"(2). Father Coughlin was initially a supporter of Frankling D. Roosevelt's New Deal, helping coin the phrase "Roosevelt or Ruin". (3) He later opposed FDR's economic and poltical ideas deeming them to be too friendly to bankers. Father Coughlin began to use his radio program to speak against bankers, FDR and Jews, who he believed were behind the financial disaster. (4) Such commentary on his part forced many of the radio stations to try to limit or cancel his broadcast and airtime. He was later required to submit written transcripts in advance for censorship. Politics: Out of frustration with the actions of FDR, Father Coughlin formed the Union Party. Father Coughlin had a disdain for "the international banker, the international Jew and international communism" (5) Father Coughlin believed in nationalizing certain industries and waged war specifically against the Federal Reserve. Father Coughlin supported Huey Long until his assassination. Father Coughlin was often associated with the populist movement. Major Activities in the 1930s: During the 1930's Father Coughlin was mainly involved with radio program, in which he spoke against many thing. This would be his main occupation until radio stations on which his show was syndicated began asking for transcripts in advance in an effort to censor him. Places where figure’s work often appears (magazines, radio, nightclubs, galleries): Father Coughlin appeared on the radio until 1940 when his antisemitic views began to be looked down upon and his isolationist views made him seem unpatriotic in the eyes of many. Father Coughlin was mentioned by Woody Guthrie in his song Lindbergh which talked about facism. Organizations s/he belongs to, causes s/he supports: Father Coughlin was a Catholic Priest who formed the Union Party out of his unhappiness with FDR policies. He was antisemitic. Father Coughlin is often labeled a populist, he was vehemently opposed to communism. Was this person a popular or critical success? Father Coughlin was popular at the height of his radio broadcast due to his anti government, anti banker and populist beliefs. His antisemitic views were controversial and were not supported by the Vatican or Cardinals. (5) The Wisconsin Magazine of History. Facism and Father Coughlin. Vol. 44, No.1, Autumn, 1960. Woody Guthrie (July 14, 1912- October 3, 1967) spent his life singing, songwriting and advocating for the rights of the common man and the Communist party. 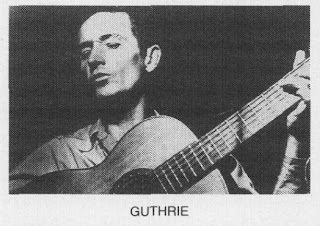 Guthrie was best known for writing hundreds of folksongs and his willingness to speak the truth on controversial issues. During the early 30s, Woody moved to Pampa, Texas and married his wife Mary Jennings. It was here that he was in his first band and began to consider himself a musician. (3) Around 1935, Woody began rambling along the open road to California in search of work. It was here that he wrote many of his earliest songs, often themed for protesting. He was given a column called "Woody Sez" in "The Daily Worker" which was known for its leftist support at the time. (6) He also worked for KFVD as an extremely popular radio personality, though his controversial views and willingness to speak his mind ultimately led to his firing. Two of his most popular works were "The Dust Bowl Ballads" in 1940 and "This Land is Your Land" in 1940. Ironically, Sarah Lee Guthrie, the granddaughter of Woody, is married to the Johnny Irion, the great nephew of John Steinbeck! The couple started their own band that is a cross between pop and folk music. Also, Woody was affectionately nicknamed "The Dustbowl Troubadour." I have researched through the TCU Library Encyclopedia Database and also the Performing Arts Database. I have also researched lyrics written by Woody Guthrie himself and heard recordings of his songs. a. Friends, people who work together, people in the same circle: Aliza Greenblatt- a Yiddish poet, Pete Steeger- a fellow folk-singer, and Stetson Kennedy- a writer and political activist. 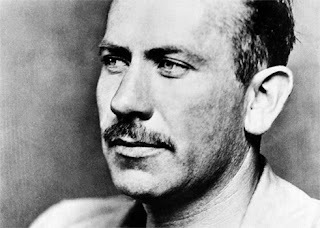 b. political or artistic allies: John Steinbeck- a writer who also supported the Communist party as a non-member and worked for fair treatment of migrant workers in California. Woody would've also appreciated Ernest Hemingway's belief that "fascism is a lie." 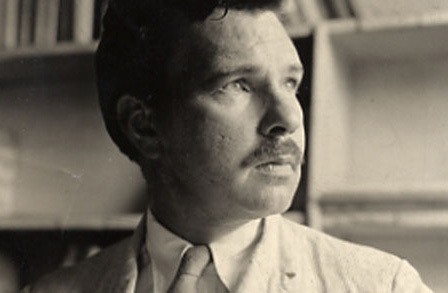 Like Guthrie and Steinbeck, Malcolm Cowley also retained leftist views without being a member of the Communist party. c. political or artistic opponents: Mill Lampell, fellow folk-singer and onetime group member with Guthrie. 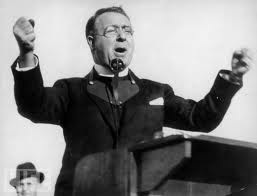 (5) Probably Father Charles Edward Coughlin if they had known each other, due to his anti-Semitic views. 2. "Woody Guthrie" Encyclopedia of Popular Music. 2008. Web. 3. The Official Website of Woody Guthrie. Woody Guthrie Publications, Inc. 2000. Web. 09 September 2011. 4. "Black Keys Join Tribute to Woody Guthrie, John Steinbeck and the American Spirit" http://www.pluginmusic.com/news/archive.php?id=3760. 5 September 2008. npag. Web. 13 September 2011. 5.Cray, Ed.. "A Desperate Little Man." Ramblin' man: the life and times of Woody Guthrie. New York: W.W. Norton, 2004. 229. Print. 6. "Woody Guthrie." Wikipedia, the free encyclopedia. N.p., n.d. Web. 14 Sept. 2011. <http://en.wikipedia.org/wiki/Woody_Guthrie>. Cowley grew up in Pittsburgh. At 17 he left for Boston to attend Harvard University, but later dropped of school and moved to Paris in 1917 to serve in the American Field Service. Two years later he came back to finish his degree at Harvard, and after graduation went back to live in Pairs with his wife of the time Peggy Baird (5). Cowley returned to the US in 1923 to live in Greenwich Village, New York. Cowley divorced Baird in 1931 and lived with Hart Crane in Mexico for a stint. Crane committed suicide, and two months later Cowley was remarried to Muriel Maurer (7). Cowley and Maurer eventually settled down in Sherman, Connecticut (5). Chronicler of the "Lost Generation" of post-World War I writers (2) and his involvement in radical politics (7). While living in Pairs after returning from WW l, Cowley was introduced to revolutionary art movements like Surrealism and Dadaism (2). In ch 16 (Rebels, Artists, and Scoundrels") of his book And I Worked at the Writer's Trade (9) Cowley says this: "Artists who succeed are strong characters, which is something different from saying they are saintly. Some of them--most of them?--do scandalous and even scoundrelly things." "But I feel that, whatever reservations there are to be made about the whole alliance between art and politics, one should make these at a time, and in a spirit, when they can be made for purposes of enlightenment, and not when the writing os such stuff is just one last final bit of the same sort of tactics, angling for position, etc." - Malcolm Cowley (8). 1. Blue Juniata published by J. Cape & H. Smith in New York in 1929. 2. The Dream of the Golden Mountains published by Viking Press in New York in 1980. League of American Writers: Erskine Caldwell, Archibald MacLeish, Upton Sinclair, Clifford Odets, Langston Hughes, Carl Sandburg, Carl Van Doren, Waldo Frank, David Ogden Stewart, John Dos Passos, Lillian Hellman and Dashiell Hammett. While in France became friendly with: Gertrude Stein, Ernest Hemingway and Ezra Pound. Theodore Dreiser caused him to become involved in "radical politics"
5. Malcolm Cowley Papers, The Newberry Library, Chicago.